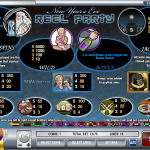 Reel Party is a 5 reels and 20 paylines slots game by Rival. You are basically at the bar on New Years Eve and waiting for the ball to drop. If like us you love this time of the year then you should really give Reel Party a closer look. There are also two scatters. The first is the Profit-like Man and landing 3, 4 or 5 will win you 5, 20 or 100 Free Spins. Yes, this is a very generous round that also comes with a 3x multiplier and a chance to re-trigger the free spins. The other scatter is the Champagne symbol and landing 3 or more will trigger the Bonus Round. This is a basic round where you’ll be asked to pick 3 champagne bottles out of many. Each will be worth a prize. This game is not very engaging and it feels a bit old. The main big thing we like is the chance to win 100 free rounds. That’s really something and can really change your day. Do you old TV shows slots? 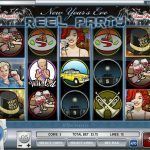 Try playing Reel Of Fortune a 5 reel slot by Rival.